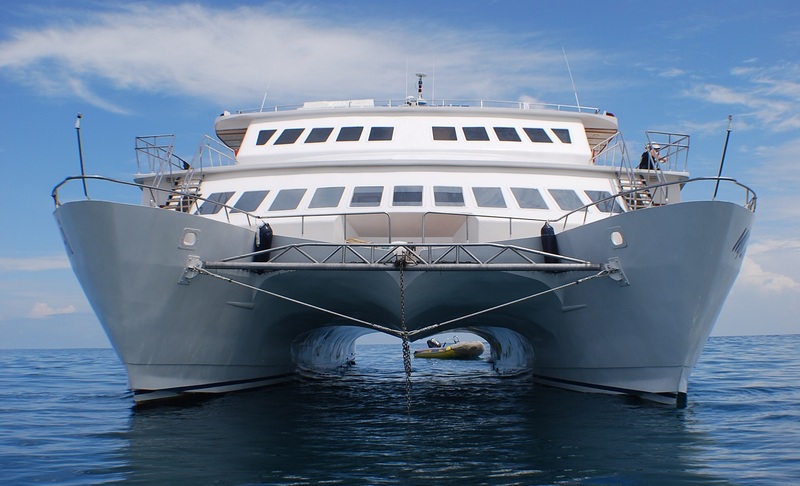 This 5 days cruise will take you through gorgeous places of the Legendary Galapagos Islands: as your first visit, Bachas beach will give you a very good introduction to the Galapagos Islands and its flora and fauna. Genovesa Island is home of the fabulous red footed boobies. Plazas and Santa Fe islands are home of the dragon-like land iguanas, while San Cristobal Island is home to the beautiful landscape of Punta Pitt, the incredible snorkel site of Kicker Rock and the highland forests with the unique Giant Galapagos Turtles and the Breeding Center. On arrival our guide will be waiting for you with a signboard with the name of our Yacht Anahi. The baggage is taken care by one of our crew members who will transport them directly to the yacht. First we will be transported by public bus to the place known as “El Muelle” (pier) from where our zodiacs will be ready to take you to the Yacht Anahi. 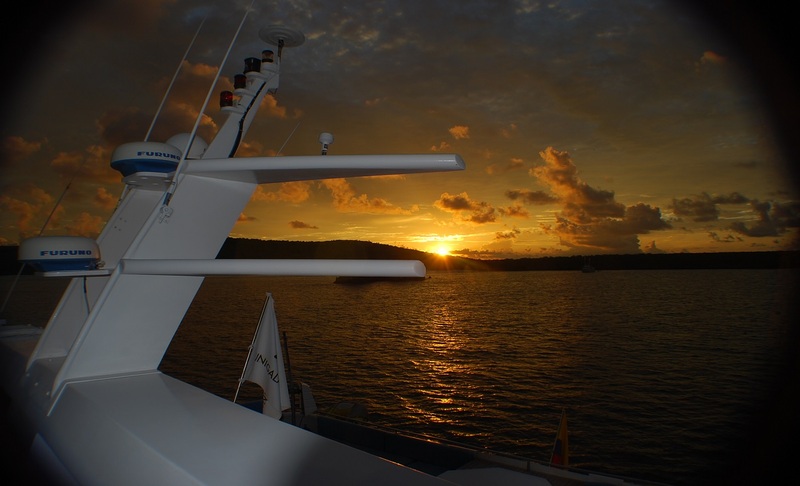 Our Captain and crew will welcome you with a drink and then you will be allocated in your cabins. Following lunch, our guide will give us a short explanation about the afternoon activities. At about 2 p.m. we will disembark with our zodiacs to be taken to the place known as Playa Bachas. The sand is made of decomposed coral, making it very white and soft, and a favourite nesting site for sea turtles. To a side of one of the beaches, we find a small lagoon where the occasional flamingo can be observed, as well as many other animal species such as the blacknecked stilts and whimbrels. The other beach is longer, and has two old barges that were abandoned during the Second World War when the US used Baltra Island as a military base. Here we will also encounter sea lions resting on the beach, as well as marine iguanas and several marine birds. 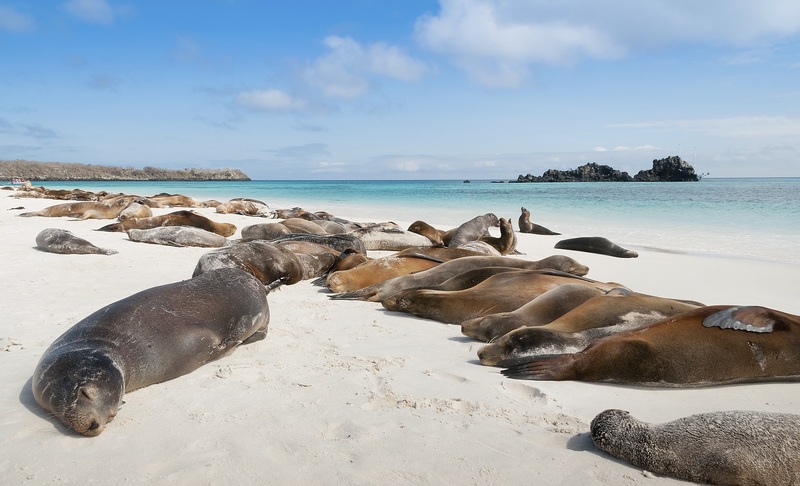 We will have some time to enjoy the calmness of the beach, as well as some time with playful sea lions that swim with visitors. At 7 p.m. you will have the official welcome reception, followed by a delicious dinner. After dinner your guide will give you a briefing about the next day activities. At 6 am. we will be arriving at Genovesa Island. 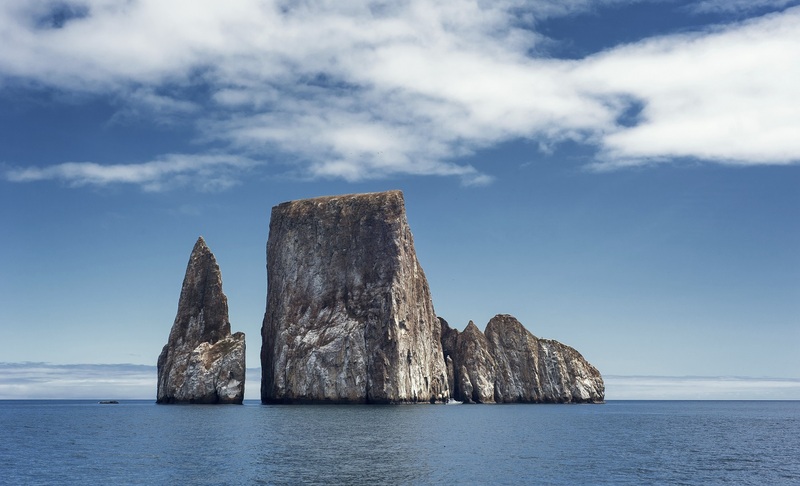 This is the northeastern most Island in the Galapagos Archipelago also known as Tower Island with just 14 sq. km in size and a maximum elevation of 64 m (210 ft). The horse-shoe shaped island has a volcanic caldera whose wall has collapsed, forming the beautiful Great Darwin Bay, surrounded by high cliffs. Although no historical eruptions are known from Genovesa, there are very young lava flows on the flanks of the volcano. 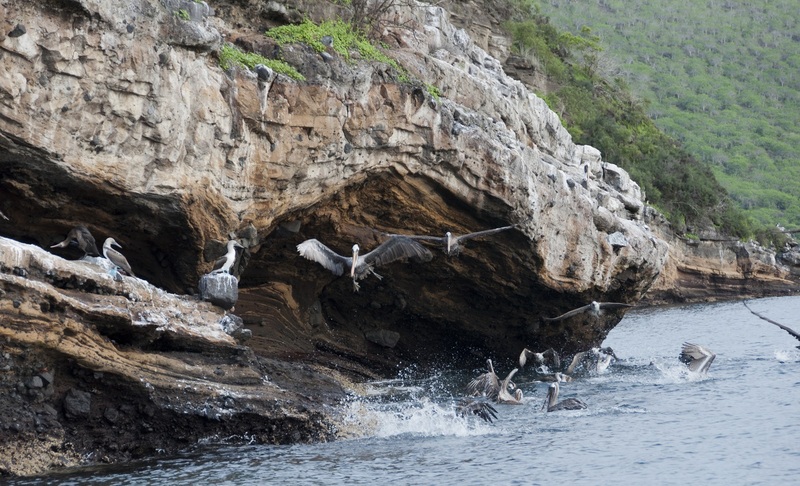 Genovesa is also known as Bird Island, because of the large and varied bird colonies which nest here. There is an abundance of frigate birds and it is among the best place in the archipelago to see Red-footed Boobies, Nazca Boobies, Swallow-tailed Gulls, storm petrels, tropicbirds, Darwin's finches, Galápagos Mockingbirds, the endemic Galapagos Dove and the short-eared owls. The first visitor site is the Darwin Bay Beach, a very beautiful site due to the great abundance of sea birds that nest on the salt bush plants that dominate the area, which we will visit in the morning. In the afternoon we head to the second visitor point which known as the Prince Philip´s Steps. We will accent 25 meters of stairs into one of the best bird nesting sites in the islands. On Genovesa we will also have opportunity for panga ride, snorkeling, kayaking and walking. Our arrival to Plazas Islands will be at around 6 am after nighttime navigation. After breakfast we start our first visit in the morning. Plazas are two small islets a short distance from the East Coast of Santa Cruz. The unusual vegetation and location of the island create an interesting landscape in which the fauna and flora of Galápagos are enhanced. Moreover, despite its small size, some of the most interesting and outstanding species of the archipelago are found here. 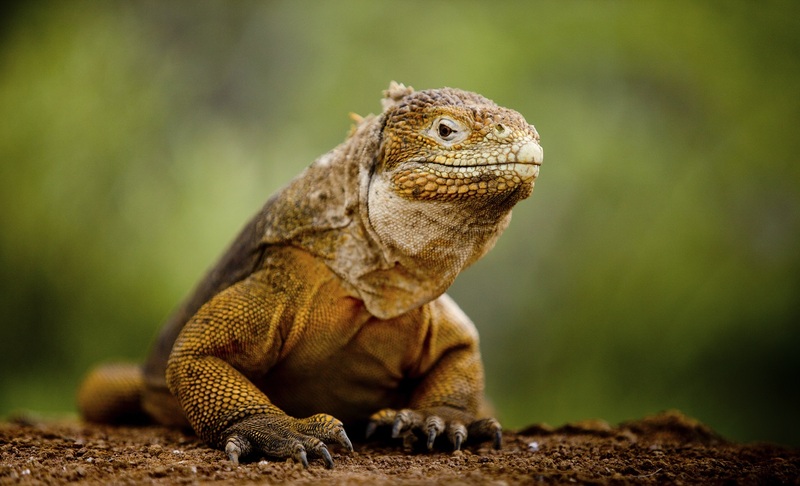 It is possible to guarantee the observation of land iguanas that often are in the shade of a cactus. Nesting on the rugged southern cliffs, are usually swallow tailed gulls, along with various other sea birds. The protected rocky seashore is a prime habitat for a large colony of noisy sea lions. The main attractions of Plazas Island include the land iguanas, the sea lions and the swallow tailed gulls as well as yellow tailed mullets, Audubon’s shearwaters, red-billed tropicbirds, frigate birds, and brown pelicans gliding past the cliff. We return to the yacht for lunch and a well-deserved rest. In the afternoon we start our second visit to Santa Fe (Barrington) Island. The small bay on Barrington’s northeast coast is extremely picturesque, where we can visit the two different trails, one leading to a scenic viewpoint on top of a cliff where it is possible to find land iguanas, endemic to the island. The other trail is near the beach and is a short circular trail where it is possible to find another colony of land iguanas, but early in the morning or in the afternoon when the sun is low. A particular attraction is the unusually tall forest of prickly cactus. Here we will also have the possibilities to do kayaking, snorkeling, panga ride and walks to observe and enjoy nature. We’ll then return to the yacht for dinner and relaxation time. 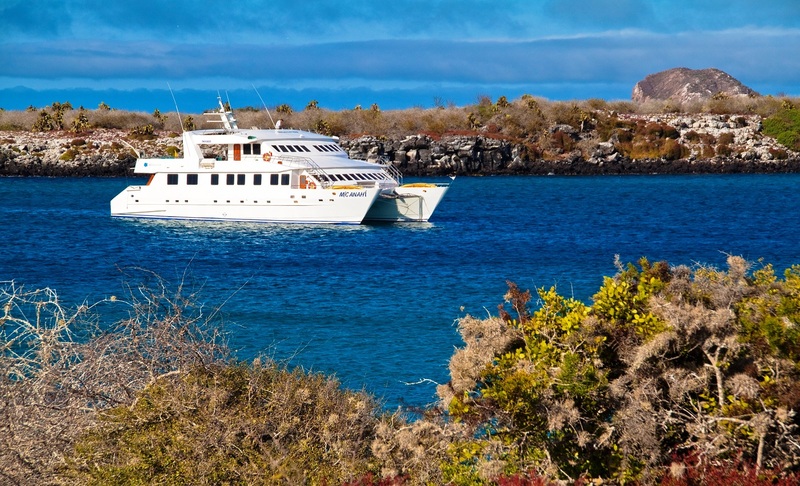 In the morning we will arrive to San Cristobal (Chatham) Island the easternmost island in the Galápagos archipelago, and one of the geologically oldest. The name "San Cristobal" comes from the patron saint of seafarers, St. Christopher. English speakers increasingly use that name in preference to the traditional English name of Chatham Island, derived from William Pitt, 1st Earl of Chatham. The Island has an area of 558 km² (215 miles²) and its highest point rises to 730 m (2400 ft). The capital of the archipelago, Puerto Baquerizo Moreno, is a small town lying at the southwestern tip of the island. San Cristobal hosts a myriad of animal life including frigate birds, Galapagos sea lions, Galápagos giant tortoises, blue and red footed boobies, tropical birds, marine iguanas, dolphins, swallow-tailed seagulls and many more. 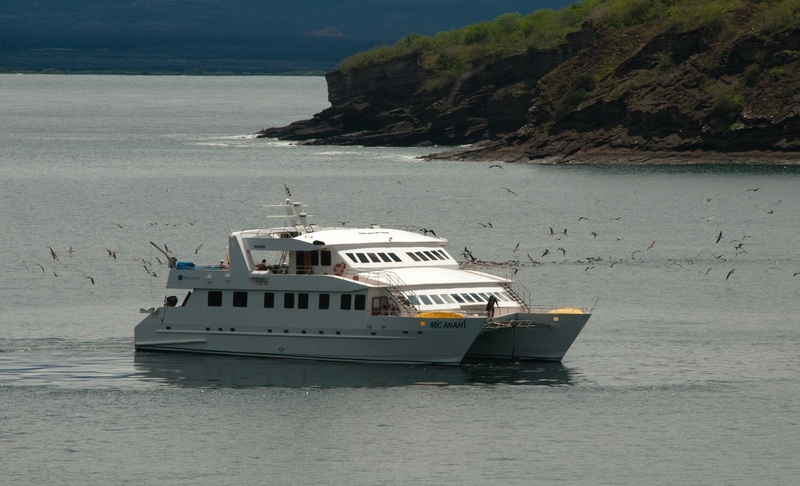 In the morning we visit Punta Pitt, considered as one of the most beautiful and impressive sites of Galapagos. The erosion of the high cliffs and the almost constant foggy morning gives to Punta Pitt an eerie atmosphere. 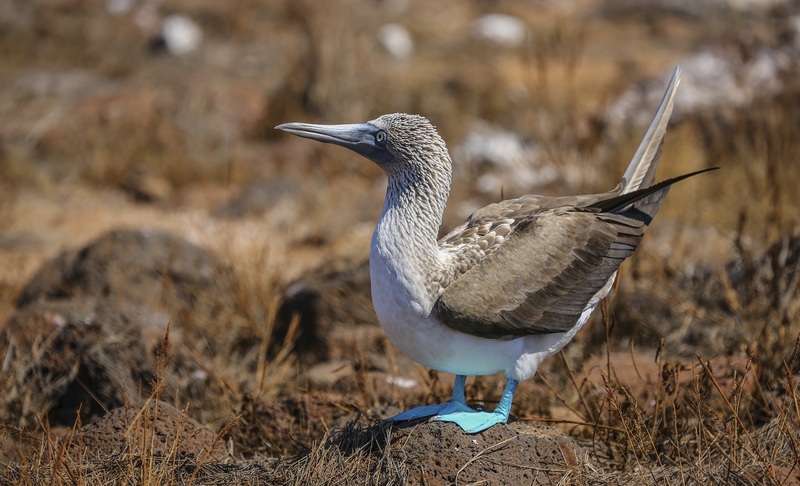 Being the northeastern most point in Galapagos, it has become amongst the favorite nesting sites for sea birds. Here we can observe the three different species of boobies and great frigate birds nesting in the same area. We return to the yacht for lunch and in the afternoon we navigate towards the giant and impressive rocky formation locally known as “Leon Dormido” (sleeping sea lion). On the cliffs we can see lots of blue-footed boobies, masked boobies, pelicans and other several marine birds. During our snorkeling activity we can observe sharks, marine turtles, sea rays, and several species of colorful fishes next to the impressive rock formation. Later on we go for a walk on Isla Lobos (Lobos Island), a small islet separated from the main Island by a narrow stretch of calm water. Upon its rocky shores blue-footed boobies nest and sea lions rest. 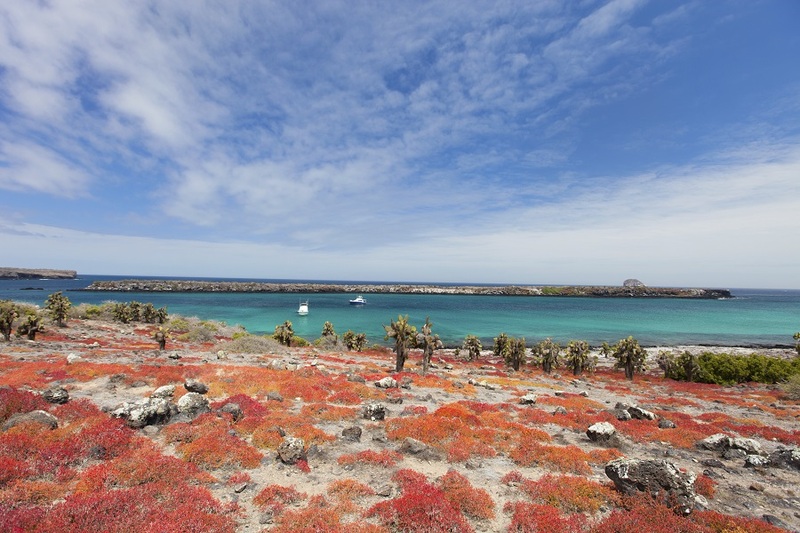 The atmosphere is one of tranquility and primitive beauty: an example of the typical Galapagos environment. In the morning our guide will take you up on the highlands of San Cristobal Island. Our tour starts from Puerto Baquerizo Moreno and our first visit point will be to the Laguna El Junco (El Junco Lagoon). Rainwater and condensation have collected for hundreds of years in the caldera of an extinct volcano, creating this haven for frigate birds. The lake in the main water supplier for the island population and thus of vital importance today. Hiking around the lake offers views of practically the entire island including San Joaquin Hill, the island's highest point. Our next stop will be at Cerro Colorado Turtle Breading Center. Here we can learn about the hard work developed by scientists in order to preserve the species of the Giant Galapagos Turtles. There is a nice walk on a trail which permits you to be in close contact with the turtles of the different sizes, from the tiny ones to the giant oldest ones. After our visit, we will be transferred to the airport for our flight back to Quito or Guayaquil. 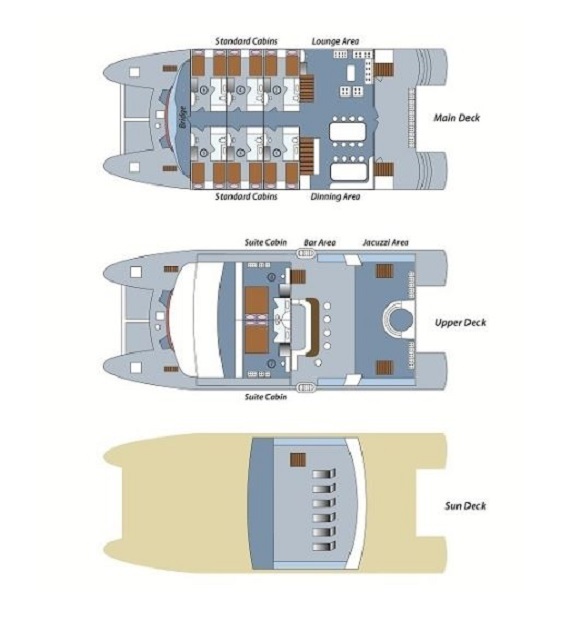 14sqm, main deck, double bed or 2 single beds, air-conditioning, private bathroom, hot/cold water and storage space. 25sqm, upper deck, king bed, air-conditioning, private bathroom, hot/cold water, lounge area, ample private facilities and storage space. Navigations generally begin between 2am to 3am. As it heads to the next island arriving around 6am. Breakfast is normally served at about 7am followed by a disembark (wet or dry) in the shores of the islands where our visits generally last for about 2 hours with hikes, snorkelling and combination of both. Lunch generally occurs at 13:00pm. In the afternoon, some of the Itineraries also involve short navigation periods that take clients to the next visit point.